Fresh venison was on the menu at the wedding dinner of the first couple married near Emporia, in 1857, a month before the town was founded. Sarah Ann Hiatt and Andrew Hinshaw were the bride and bridegroom, and Rev. Solomon G. Brown, beloved pioneer preacher of Lyon County, was the minister. The bride and bridegroom and the preacher are dead. But Mrs Margaret Gilmore, who was then little Margaret Brown, daughter of the minister, recalls vividly the day of the wedding, and the wedding feast which she helped to prepare and serve. "Very well do I remember that wedding day of Mr. and Mrs Hinshaw and helping my mother and my sister, now Mrs. Sarah Staley, to prepare the dinner and serve it," said Mrs. Gilmore. "We girls were taught to cook and help serve early in life". "I remember we had for meat, fresh venison, or deer meat, as well as some fresh pork of our own raising; hot biscuits, coffee, and some vegetables. We had our own milk and butter, with cheese, eggs, cream for our coffee, and for our dessert we had dried peach turnover pies. And best of all, everyone had splendid appetite and enjoyed it as much as if it had been a dinner served in Emporia's beautiful 7 story hotel instead of in a very crudely built log cabin, near the banks of the Cottonwood River". "It was indeed a solemn, joyous occasion, and we didn't mind the cabin, at least not perceptibly. The bride, a slender girl of just past 18, wore a beautiful flowered silk dress, that had been purchased on the way to the strange west seven months before. She was beautiful, shy and modest, and had previously endeared herself to us as our nearest neighbor one-half mile away, with the Cottonwood River between us. "The groom wore a black Quaker-made coat, brought all the way from Iowa for the occasion, and with his white shirt and black tie, looked every inch a proud, but dignified groom. He was nearly 10 years her senior. It was a wedding long to be remembered -- the first occurring in my father's house. My father, the Rev. Solomon G. Brown, dressed up for the occasion, as did my mother and we children, for there was a holiday air about it all. The couple had crossed the river on the ice and was a beautifully still, frosty-smelling morning". "We two oldest girls waited on the table, though 'setting to' and helping ourselves as occasion permitted. Though later, in our new house, there were many weddings of prominence and otherwise, none stand out to us quite as pleasantly and distinctively as that first one, on that beautiful seventh of January, 1857". Andrew Henshaw, age 31, born in North Carolina; farmer; $1500 real estate; $500 personal property. Sarah A. Henshaw, age 21, born in Indiana. Stephen C. Henshaw, age 3, born in Kansas. Sabina E. Henshaw, age 3 months, born in Kansas. Hinshaw, Andrew, age 43, born in North Carolina; farmer; $21100 real estate; $2675 personal property. Hinshaw, Sarah Ann, age 33, born in Indiana; house keeping. Hinshaw, Stephen C, age 12, born in Kansas. Hinshaw, Sabina, age 10, born in Kansas. Hinshaw, John E., age 8, born in Kansas. Hinshaw, Leaten R., age 6, born in Kansas. Hinshaw, Minda J., age 4, born in Kansas. Hinshaw, Ruth Ann, age 6 months, born in Kansas. Hinshaw, Andrew, age 51, born in North Carolina; parents born in North Carolina; farmer. Hinshaw, Sarah A., wife, age 41, born in Indiana; father born in Ohio; mother born in North Carolina; keeping house. Hinshaw, Laten R., son, age 15, born in Kansas; father born in North Carolina; mother born in Indiana; farm laborer; attended school. Hinshaw, Mindie J., daughter, age 13, born in Kansas; father born in North Carolina; mother born in Indiana; attended school. Hinshaw, Ruthana, daughter, age 10, born in Kansas; father born in North Carolina; mother born in Indiana; attended school. Hinshaw, Ennettie V., daughter, age 7, born in Kansas; father born in North Carolina; mother born in Indiana; attended school. Hinshaw, Fredick R., son, age 3, born in Kansas; father born in North Carolina; mother born in Indiana. ANDREW HINSHAW, farmer, Section 18, Township 19, P. 0. Emporia, was born in Randolph County., N. C., January 10, 1829. 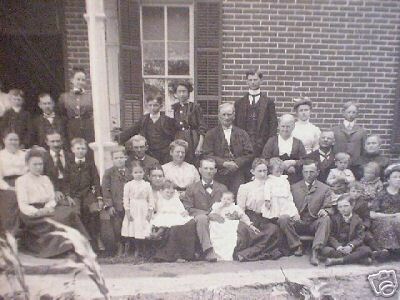 When less than two years old his parents removed to Hamilton County, Ind., where Mr. Hinshaw was raised and resided until he came to Kansas, in December, 1856. He located in Lyon County, and in February, 1857, took a claim of 160 acres just east of the present city limits of Emporia. He continued to farm this land until 1869, when he traded the east half of the quarter section for 150 acres of land about two and one-half miles east of town. Upon this farm he has erected a fine brick dwelling house, a large frame barn and other outhouses. Has an orchard of 400 appletrees, 400 peachtrees, 100 cherrytrees, 20 peartrees, and a number of smaller fruits. Has had fresh peaches three months of the year for last three years. Has put in a windmill, and would not do without it for twice its cost. 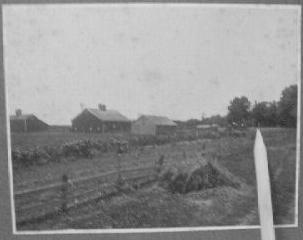 Besides the home farm of 150 acres, Mr. Hinshaw has 120 acres about two miles east of the same, of which one-half is now farmed by his son, S. C. Hinshaw and the balance by his other son, J. C. Hinshaw, and twenty-seven acres remaining of the old claim he took in 1857. He gave ten acres to the M. K. & T. R. R. Co., and five acres to the A. T. & S. F. R. R. Co. 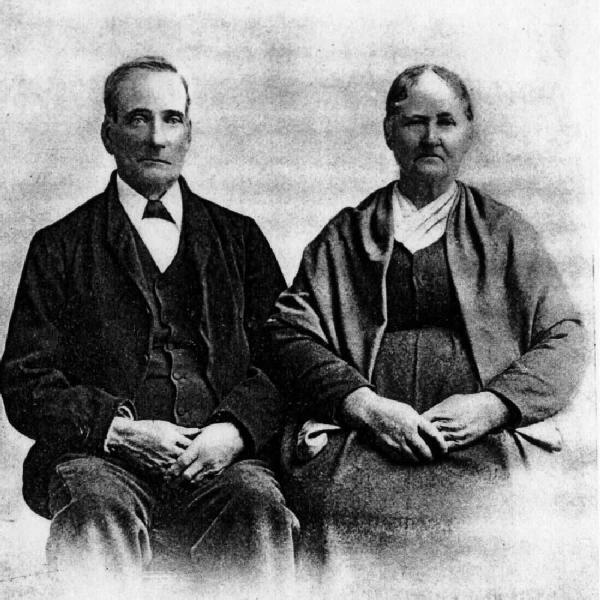 He married January 7, 1857, Miss Sarah Ann Hiatt daughter of Curtis Hiatt who came to Kansas from Hamilton County, Ind., in May, 1856, and they have eight children, four boys and four girls, all of whom are living. The family are members of the Society of Friends. J.H. McMillan and family attended the 50th wedding anniversary of their parents and grandparents, Andrew and Sarah Hinshaw, Monday at their home east of Emporia. Hinshaw, Andrew, head-of-household, age 81, born in North Carolina; parents born in North Carolina; first marriage, married 53 years; occupation: manager, general farm; owned farm. Hinshaw, Sarah Ann, wife, age 71, born in Indiana; father born in North Carolina; mother born in Ohio; first marriage, married 53 years; 8 children, 8 living. 1860 census, Emporia P.O., Emporia Township, Breckenridge County, Kansas; roll M653-346, page 47, line #4, dwelling #424, family #335. 1870 census, Emporia Township, Lyon County, Kansas; page 203, line #38, dwelling #217, family #217. 1880 census, Emporia Township, Lyon County, Kansas; roll T9-0387, ED 110, page 292B, line #41, dwelling #91, family #93. 1910 census, Emporia Township, Lyon County, Kansas; roll T624-445, ED 52, page 197A, line #1, dwelling #106, family #107. 1860 census, Breckenridge County, Kansas; volume 4, page 192. 1870 census, Emporia Township, Lyon County, Kansas; page 203, line #20, dwelling #211, family #211. Emporia Gazette, Lyon County, KS - Thursday, January 10, 1907; "PLYMOUTH NEWS". 1910 census, Emporia Township, Lyon County, Kansas; roll T624-445, ED 52, page 197A, line #11, dwelling #110, family #111.